We went to the RISE festival outside of Vegas a few years ago, lighting lanterns and releasing them into the sky. However, Chiang Mai on New Years... they take it to another level! It was really hard to find any information on where people were gathering or where to go for New Years since they have another lantern festival about a month before. 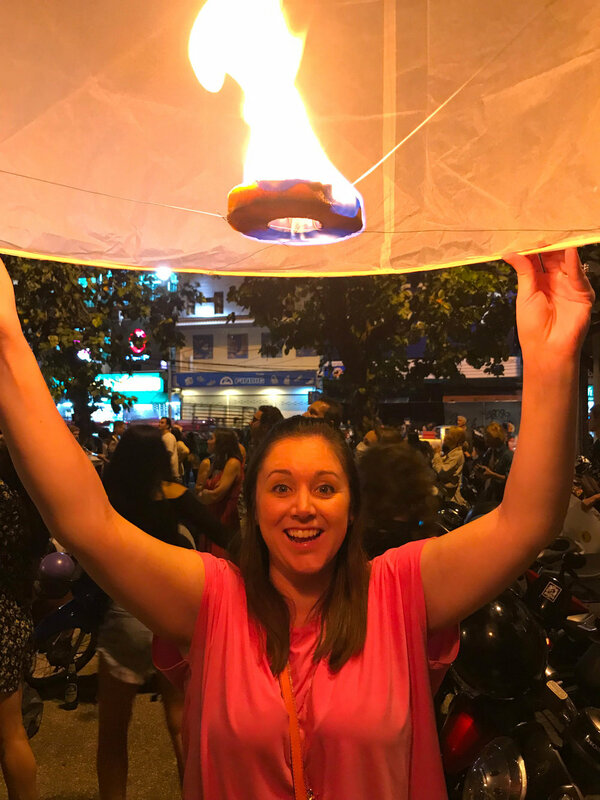 Not only is it a party in the streets, but lanterns are released everywhere ALL night long! We made our way from our hotel to the Tha Phae Ancient City gate to which we found a mob of people. On the other side of the gate, there was a street fair full of vendors selling food and other merchant goodies. Filled with wall to wall people and completely overcrowded, Rachadamnoen Rd was completely shut down, packed like a fish swimming upstream! Vendors sold all sorts of things: shirts, wallets, chachkies, food, jewelry, wood carved animals, you name it - they had it! I couldn't stomach the street food and we ended up going to another restaurant near-by where we could watch the lanterns sail by. We found a truck parked in an alley that was selling lanterns 3 for 100 Baht and we also bought a lighter at a nearby 7-Eleven! PRO-TIP: The lighter is key! Everyone was asking to borrow ours! The Tha Phae Gate (ancient city gate) has the largest gathering of people who are setting off lanterns all over the place! We found a spot around 11:30pm and did a test lantern to make sure we would be pros at midnight! Yes, I am wearing elephant pants that I bought for $2! Many lanterns ended up in trees and I am so glad nothing caught on fire or anyone got hurt. By the time midnight rolled around, we were ready to go. It takes about 3-5 minutes for these things to fill with air to take flight. Amongst these beautiful lanterns, fireworks started to shoot off. I was officially in a Disney movie and the lost princess was saved (that is a Tangled reference with Rapunzel if you didn't catch that)! This night was truly breathtaking and one I'll never forget! Like I said in the beginning, it was really hard to find info for Chiang Mai on New Years. Please feel free to contact us on our Contact Page or comment below if you have ANY questions!